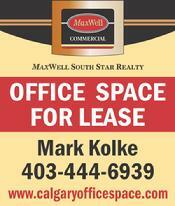 If you need space to LEASE ... office, industrial or retail - stay right here, you've come to the right place. Office space can be leased 'as is', with work to be done by the Landlord and/or Tenant, pre-leased in the case of a planned building or one under construction. Tenants usually lease a portion of a building however leases of entire buildings of all sizes is not uncommon either. In short, whatever two parties choose to negotiate and agree upon is possible. Naturally, the Landlord needs to be the owner or legally empowered party to commit to leasing the premises, the space must meet legal requirements (zoning, building code, fire code etc.) and be in a habitable state. People do business with people they know, like and trust. Mark Kolke is a licensed real estate professional. Most of his work is in office leasing. He primarily acts as a Tenant Representative Agent, helping clients search the market, navigate issues and negotiate a lease. Issues of cost, timing and location are obvious key areas he focuses on - but primarily he focuses on his client's business needs and forging a working relationship.